Following is my response to an article published in the journal Design Intelligence regarding the future of sustainability. The article, "HOK Reexamines Future for Sustainable Design", was written by Sandra Miller, an architect with HOK. Thank you for your article which raises a number of important issues. The quality of the series of comments and replies here attest to their significance. I believe strongly that humanist values need to be incorporated into sustainable work (in fact in all work, architectural and otherwise). Measuring and analyzing human values is problematic at best. At worst, it can lead to horrible rigidity, regulation, and a lack of freedom (fascists, communists, and corporate capitalists are all culprits). My hope is that a series of common human values can be delineated; Perhaps in the form of a "Declaration of Interdependence". Measuring and monitoring work against human values will necessarily have to be a work-in-progress that ideally should include the entire community of users, designers, engineers, public, ecologists, sociologists, urbanists, politicians, etc. Trying to strictly quantify qualitative issues will only have terrible consequences. Many of the arguments for sustainability have their root in ethics and morality. Some of the ideas are based on objective scientific research and the dangerous circumstances facing humanity. I will never accept the idea that a widespread success of sustainable practices will be possible if it is based solely on rational, scientific analysis. Human behavior is just way too complex to ascribe a specific method of thinking toward achieving a worthy goal. The American revolutionaries had a wide variety of reasons for wanting to break away from Great Britain. We need to work to consolidate such common interests in the interest of advancing the sustainability movement. Sustainability, just like the 70's environmental movement before it, resonates with the public for a wide variety of reasons. Many of the reasons are self-serving, as I'm sure you're more than aware. People and corporations eager to earn the mantle of being judged "sustainable" have a mass of motivations, some of which are based on ethics and morals. Other more self-serving motivations relate to public relations, marketing, establishing brand identity, earning customer loyalty, increasing profits, etc. The fact that multifarious motivations are contributing to move sustainability forward doesn't diminish the positive nature of the changes. I believe that ultimately to be fully successful, the principles of sustainability will have to be lived and understood in a much more holistic way than is possible today. When decisions about design, materials, fabrication methods, energy use, transportation, pollution, etc., can be thought about without constant direct reference to "hard numbers" (i.e., when these principles become integrated into our thought patterns and overall approach to life) only then will more significant progress by made toward achieving the greater goals of sustainability. In the meanwhile, we need to use all means necessary (financial, aesthetic, moral, and personal) to help move it forward. Eventually, sustainability will have to be intrinsically understood and applied in every small action and decision made by millions/billions of people on a daily basis. My hope is that children growing up today will learn to recognize the patterns of behavior required to further life on this planet. While humanism sounds wonderful (and I believe it is), it has some drawbacks as well. I believe these are the source of many scientists' concerns when they begin hearing about touchy-feely issues that smack of subjectivity (like beauty). For them, you're already on the slippery slope of things with only relative value and beyond what is not objective and measurable. Another concern I have relates to defining humanism. Does it get defined? According to what the human race seeks to accomplish? By whom? How do ecosystems, animal life, plant life, and other natural features become measured and incorporated? What about controlling population growth? Increasing food production and distribution? What about the ethical treatment of animals in food manufacturing? What about future implications related to exploiting the world's natural resources in general? Is it possible to integrate spirituality into sustainable practices? If that's possible, then many difficult problems can possibly be addressed. I realize that the over-arching goals of sustainability relate to some very large, relatively difficult questions and concerns. Several programs produced by National Geographic (cloaked in the form of a mystery series on PBS, i.e., "Strange Days") relate directly to some of these issues about the depletion of natural resources, the reduction in sufficient genetic variation in life forms, and other large issues. This series suggests that looking historically, that every step forward in human development from developing the use of fire, to tools, to metalworking, to agriculture, to military organization, to urban development, to today's digital/virtual world and on; that all of these "accomplishments" have in part been achieved through the sacrifice of some other species, resource, or other feature of our world. The dominance of humans on the earth has remade it altogether, such that it would be impossible to return even a few hundred years to revisit the industrial revolution, darwin, and scientific knowledge and technology in general. If we knew then everything that we know now, would we have been able to chart a significantly better course for the world? Would the world as a complete planetary system be better off with two billion people rather 'X' billion? How can that issue be addressed meaningfully with respect to sustainability? Expecting the federal government to take control of this movement and the direction it takes would be foolhardy. A mix of private and public funding should help to balance the true results of sanalysisc anaylsis and the desirable results that one manufacturer might like to obtain over another. There needs to be independent oversight of the LEED process, which I believe is starting to take place. Like McDonough, I agree that saying that things are "sustainable" isn't terribly captivating. For the movement to continue to grow and expand, it will need new words, new terms to help "sell" the idea to the public at large. To make this happen, more than facts and figures will be required. Financial incentives, education, local cooperation, national organization, and many other elements will have to fall into place for the kind of more substantial results that many people seems to want. I'm a Saint Louis architect with a small practice. I continue to develop and learn sustainable practices and incorporate them into my projects where applicable. I see this process as one of lifelong learning with a clear goal, but not entirely clear steps toward achieving those goals. Our progress in this area will most likely involve trial and error, case studies, and local and regional variations of approach. A multiplicity of approaches considered simultaneously will get us closer to our goal more quickly than following a single, unified theory that could later be proved faulty. The example of the concept of natural selection could be an entirely appropriate model for this movement. Thank you for considering my comments. I look forward to learning more. An article in the Saint Louis Business Journal by Liz Braun describes our work on a Harris Armstrong home from the 1950s. 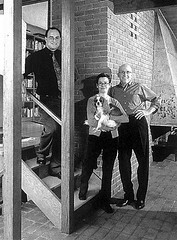 Armstrong's original clients for the home were the Vollmers. In the 1990s, the Vollmer family sold the house to its second owners: Anne Bergeron and Steve Wellmeier. Anne and Steve had moved to Saint Louis from the Big Apple based upon a job change. They were particularly interested in purchasing a modernist home. Initially, their inclination was to live in the urbanized part of Saint Louis City, but were disappointed by what was available and the condition of the city itself. They began to search outside the city proper and engaged a realtor to help them find a home. They were shown many homes around West County that fit the more "standard" house type: two-story colonial. They weren't pleased with the homes that seemed to be on the market. They began driving and exploring various neighborhoods and communities that seemed promising. Anne stumbled across the run down looking ranch at the end of Sherwyn Lane and asked their realtor to show it to them. It was explained that the house was a "tear down" that no one would want to purchase because ranches from the 1950s were no longer popular. Anne and Steve persisted and visited the house despite the recommendations to the contrary. It is quite understandable why most people wouldn't see a whole lot of promise in the house. It was dark on the interior, the landscaping was overgrown, wood-rot was evident on the exterior, and the split-level configuration was not readily adaptable for renovation and alteration. Anne and Steve were able to "see through" the layers of grime, old wallpaper, etc. and proceeded to purchase the property. You can also view the Saint Louis Business Journal article in a format similar to the published version here: Raimist revives Harris Armstrong architecture. The Den is located one half level up from the Kitchen / Living Room. 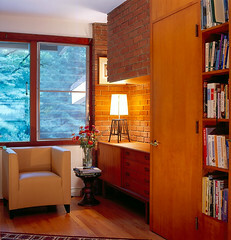 The brick work at the right is located at the back of the large fireplace in the Family Room. A thick steel plate supports the portion that's cantilevered at the center. 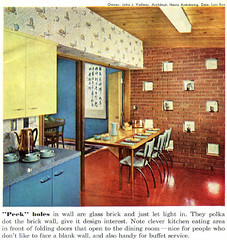 Published view of the Kitchen with the Breakfast Area in the Vollmer Residence designed by architect Harris Armstrong, FAIA. The original black and white photograph was 'colorized' in the printing process. This kitchen was virtually untouched when I first visited the house in the late 1990's. The wallpaper, the linoleum tile, metal cabinets . . . , it was all just as it had been in the 1950s. The cabinet colors are approximately correct, although the actual colors were a bit more pastel. The floor was not red at all. Originally, Armstrong had designed this entire level of the house to have finished concrete floors stained black. The original intention was that the floor have radiant heat, but this was eliminated due to budget constraints. Apparently the Vollmer's had a difficult time keeping the floor clean (or, at least, looking clean). So they installed linoleum tile over the concrete floor relatively soon after moving into their new home. The blue wall of the Dining Room (visible to the left of the Breakfast Table) isn't shown accurately in the colorized image. The actual blue was a deep blue and relatively dark. Something of the effect can be sensed in the snapshots taken by the Vollmers. 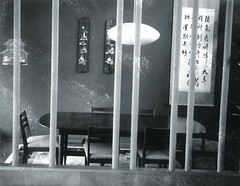 Snapshot of the Dining Room. View of the Living Room looking toward the Southeast. The exterior deck is to the right where the heavy timber beams cantilever beyond the glass wall. 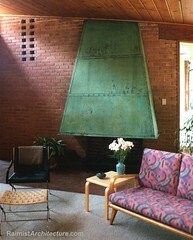 The copper hood for the fireplace is typical of many of Harris Armstrong's designs of this time. The glazing is generally large panes of fixed (thermal) glass. In this main living space, cross ventilation is provided by jalousie windows fitted with screens located in the corners of the room. The hearth is comprised of brick pavers set into floor. The wrought iron log support was custom designed by Armstrong. The line of brick pavers runs North-South from the front entry to the fireplace dividing the house into the public one-story portion to the West and the two-story private portion to the East. Anne Bergeron and Steve Wellmeier stand with their dog Lily at the bottom of the stairs. I'm a few steps up on the left. This view from the front door reveals all three levels of the house. 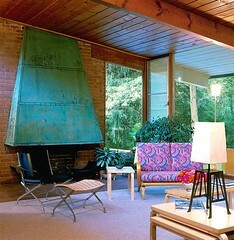 The brick pavers in the floor lead straight to the fireplace ahead. These bricks form the base of the hearth. The winding steps at the left wrap around a square skylight. Going up a half level takes you to the bedroom / study portion of the house. Going down half a level takes you to the boy's bedrooms, playroom, and utilities. Living Room with original fireplace. View of the fireplace in the Bergeron / Wellmeier Residence following the renovations. The hearth is composed of brick set flush with the floor. When you enter the home the view is straight toward the fireplace (and outward to the window, deck, and yard beyond). The path of bricks in the floor determines a very definite pathway from the front entry through the house. it also demarcates the line between the public spaces and the private spaces of the house. The public spaces of the house comprise the Family Room and Dining Room. These two "rooms" are divided by an open screen which allows the room to work visually as one space, while working functionally as two. Adjacent to these two main spaces are the Kitchen and Breakfast Table. All of these spaces are on the South side of the brick band. Once you cross over the bricks toward the North, you must go half a flight upward or half a flight downward. Upward are bedrooms, bathrooms, and study. Downstairs there are two additional bedrooms, bathroom, laundry, and utility area. 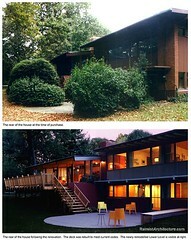 The original house was designed by Harris Armstrong, FAIA for the Vollmer Family in the 1950's. While the budget was limited, they were able to acheive great economy of means by making the most of all spaces incorporated into the house. It is designed using passive solar principles with large overhangs and tall glass walls facing south. In another post, I'll give a before an after comparison (before renvoation and following completion). since posting a lot of images that i'd taken some time ago or were scanned for my Harris Armstrong research, i started taking more photographs with my Nikon 4300 digital camera. it isn't the most flexible camera, in the sense that its not easy (or possible?) to control the shutter speed, the aperature, etc. however, i've been able to do some interesting things with it. certainly the freedom of a digital camera, with 'disposable' images, has given me a great deal more comfort in shooting 'from the hip' and experimenting with image making, like i used to when i first started in photography around age 10 to 12.
i'm thinking/hoping that i'll be able to use Blogger, Flickr, and my website in an integrated, synergistic way. that's the hope anyway. Flickr mostly for images. Blogger mostly for words and links. Website for issues specifically related to architecture, my practice, research, etc. i'm very new to the concept of the blog. i've read a few on occasion, but i haven't followed any consistently over time. my sister rachel encouraged me to create this account. i've been hestitant about using it. but now, i'm going to try to use the enthusiasm i've developed for Flickr to invest more time into using Blogger. while my primary goal is getting myself to write out many of my thoughts, ideas, and drafts for my book on Harris Armstrong. being june now, my goal of completing the text of my manuscript for the book before the end of 2005. i feel like this year is the time for me to finally finish it. i'm planning to make use of Flickr and Blogger cooperatively. i'll post photographs, drawings, and other images pertinent to the book on Flickr and create links between them and Blogger texts to which they are associated. i will probably also use the process of pasting images into the Blogger text itself. at this moment, i don't know how to do this, but i'm sure i'll figure it out.